This year marks the 75th anniversary of the Karaikudi Kamban Kazhagam, the seeds of which were sown by Saw. Ganesan. A neat turn of phrase, an apt simile, a brilliant metaphor, the euphony of a word -- can all delight, for the felicitous use of language does give one a frisson of thrill. But even so, will anyone deify a language, not figuratively, but literally? One man did. 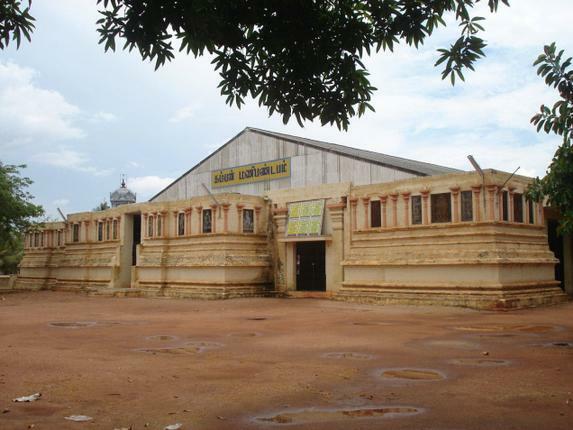 Kamban Adippodi Saw. Ganesan. Ganesan’s love for Tamil began when he was in school. Those who encouraged him to study Kamba Ramayanam included P. Sri, the author of Ananda Vikatan’s‘Chithira Ramayanam’, who lived in Karaikudi for some years, Va. Ve. Su. Iyer, T.K. Chidambaranatha Mudaliar (TKC) and even a scholarly grocery store owner in Burma! 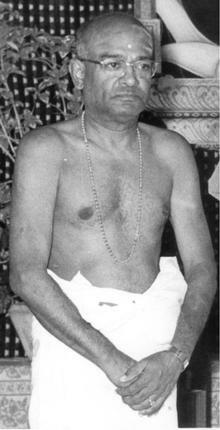 It was in 1939 that Ganesan set out to organise Kamban Vizha in Karaikudi, under the stewardship of TKC. From 1935, Ganesan was actively involved in the Freedom Movement. His participation in the Quit India Movement resulted in his house being raided by the police. Several lakhs worth of property was confiscated. Unperturbed, Ganesan went about in disguise, giving rousing speeches to mobilise the youth against British rule. The police then arrested his friends, and to save them trouble, Ganesan surrendered, and was promptly despatched to the Alipore jail. But even while in prison, he ensured that the Karaikudi Kamban Vizha continued. The Kamban Vizha is held in Karaikudi in the Tamil month of Panguni, and concludes in Nattarasankottai, in the star Hastham. Ganesan had a reason for choosing Hastham. There is a verse that says that Kamban inaugurated his work on Panguni Hastham. There is yet another verse that says Kamban died in Nattarasankottai. Ganesan visited Nattarasankottai, and found that the villagers there worshipped at a certain place, which they called Kamban Samadhi. Ganesan saw them taking mud from a pit near a rough hewn stone, beneath which Kamban was believed to have been buried, and applying this mud on the tongues of their school going children, in the belief that Kamban would bless their academic endeavours. Ganesan came to the conclusion that this must be Kamban’s burial place and so he decided to organise the last day of the celebrations at Nattarasankottai. In 1940, Ganesan asked Vaidyanatha stapathi to make a panchaloha idol of Tamizh Thai, Tamizh represented as a Goddess. Tamizh Thai is seen seated on a globe to indicate the geographical spread of Tamizh. She holds in her hands palm leaf manuscripts, a japa mala, the torch of knowledge and a Sengottu yazh, described in Tamil literature and a sculptural representation of which is seen in the Tirumeyyam temple. Ganesan’s friends presented him with a purse for Rs. one lakh on his 60 birthday, and he used the money for a Kamban Mani Mandapam, the construction of which was completed in 1972. Praising Ganesan’s dedication to Kamban, Justice Maharajan gave him the title ‘Kamban Adippodi.’ Ganesan conceived of a temple for Tamizh Thai, but passed away before the project was completed. Upon his death, the mantle fell on Kamban Adisoodi Pala Palaniappan, who, as a school student, came under the tutelage of Ganesan, and helped draw up programmes for the Karaikudi Kamban Vizha. Later, Palaniappan became the secretary of the Chennai Kamban Kazhagam. The Tamizh Thai temple was declared open in 1993, by Mu. Karunanidhi. The main shrine is for Tamizh Thai, and on either side, we find Agastyar and Tholkappiyar. Outside the main shrine are icons of Oli Thai (The Goddess of Sound) and Vari Thai (the Goddess of Letters), with separate enclosures for Kamban, Ilango and Valluvar. The temple construction and sculpturing work were by Ganapathy stapathi. I am curious about why Kamban is always depicted with a walrus moustache. “The moustache was inspired by TKC’s luxuriant moustache,” laughs Palaniappan. Almost all Tamil scholars have participated in the Karaikudi Kamban Vizha – A.C. Paul Nadar, Professor A.S. Gnanasambandam, Ra.Pi. Sethupillai, Dr. Francis Jayanandan, who was secretary of the Christian Literature Society, Xavier Tani Nayaka Adigal, Mu.Raghava Iyengar, Kamil Zvelebil and Justice Ismail, to name a few. On the other hand, people who called themselves atheists would wangle a slot in the proceedings, and then make veiled attacks on Kamban. When it was suggested to Ganesan that he prevent such people from speaking, he would say that no one could be immune to the charms of Kamba Ramayanam for long, and even those who aimed barbs at the work, would soon come round. And sure enough, the same people who had mocked Kamban, would in later years, speak admiringly of the bard. This year marks the 75th anniversary of the Karaikudi Kamban Kazhagam, and an international conference will be held in Karaikudi. The speakers include medical doctors and professors of engineering, based in London and Paris, all of whom have one thing in common -- love for Kamba Ramayanam. It is not often that one’s dreams result in fruition, and even when they do, few dreams survive beyond one’s lifetime. But the Karaikdui Kamban Kazhagam continues to thrive, and is a tribute to Saw. Ganesan, whose zeal and grit shaped it. For details, call Palaniappan at 94450 22137.